Imagine the warm Caribbean sun on your face and a cool breeze in the air as you sail through one of the most mesmerizing places on the entire planet. 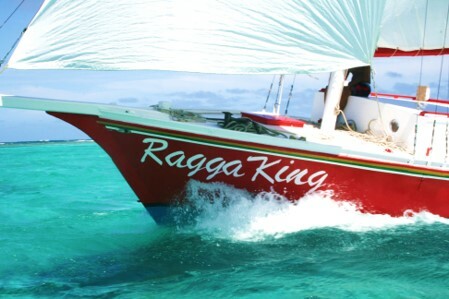 Ragamuffin Tours has worked hard to put together the ultimate Belize sailing tour. It starts at Caye Caulker in northern Belize and finishes in the colorful town of Dangriga on the southeastern coast. For three days, you’ll be sailing through some of the most majestic parts of the Belize Barrier Reef, a UNESCO World Heritage Site. Day one begins with a morning departure from the lovely island of Caye Caulker which can be easily reached by water taxi or a short flight from Belize City on the mainland or Ambergris Caye. From there, the sailing adventure will include traversing through picture postcard perfect scenery with at least two stops along the way to enjoy some snorkeling every day. The crystal clear waters and abundance of marine life make scuba diving here an ideal way to see large schools of fish, rays, sharks, five different species of sea turtles, and even the occasional manatee or dolphin. And for anglers, there will also be ample opportunities to work on your Grand Slam as several species of gamefish are easy to find in this area of the reef. The boat comes with trawling rods, spin rods, hand lines, and spear guns. Whether you want to fish from the boat or head to shore to try spin casting or spearfishing, there are lots of chances to catch fish on this tour. Day one ends at the well-named Rendevouz Caye, an uninhabited island equipped with very simple thatched-roof camping shelters. For travelers with more upscale needs, there are luxury accommodations also available at the nearby Ragga Caye. In the evening, avid snorkelers can go for one last expedition in the waters surrounding the island. Day two is much the same as day one – sailing through turquoise waters and enjoying lots of fishing and/or snorkeling. Remember, anything you catch can be prepared fresh to order by the onboard chef! Day three includes stopping by a manatee sanctuary before heading to port in Dangriga. Once back on dry land in Dangriga, you can rely on Barefoot Rentals and Services for all your travel needs. Barefoot has a full fleet of cars, golf carts, and motorbikes that are ideal for exploring Belize. Barefoot Rentals and Services also offers door-to-door shuttle service to and from any location in the country. Visit www.barefootservicesbelize.com to learn more about what to see and do in southern Belize.